← Would you like to host in April? Let’s see how yours turned out! Links only, please. Save the chatter for the other post! ***** Edited to add: If your post doesn’t show up right away, please don’t comment multiple times. Chances are it’s caught in the spam folder and it will be approved very soon. Thank you! This entry was posted in Leave Your Link, TWD:BWJ, weekly. Bookmark the permalink. Will be up this evening at midnight! I hope this would have made my Irish great-grandma proud! A small personal miracle here- I am not late this time- a lovely Irish recipe! To be posted early AM. I know exactly what you mean…I never was able to post for the rugelach! Will be up at midnight this evening. Really enjoyed this recipe! Will be up early Tuesday morning. going live at midnight, central standard time. Looking forward to see what you all baked up! I do loves da soda bread! Love the simplicity of this version – it’s the perfect vehicle for yummy stuff schmeared on top. (Link will be live at 1am eastern). Can’t wait to read about everyone’s variations! Here’s my link. It’ll go live at midnight. It was tasty with stew! Sadly, it didn´t work out quite like I expected. Love baking in this group. This bread was great! I made a sweet version and an ‘Asian’ version. Loved the easy recipe! Excited to try variations. A few golden raisins for taste and texture made it just right. So easy and so good! I loved it! Pingback: TWD: Irish Soda Bread | I'm At Home Baking! Here’s mine, I loved it! my first TWD recipe & link-up. such a tasty loaf of bread to warm our rainy st.patty’s day! We enjoyed this so much! I made this the second I woke up and was highly rewarded for it. I’ve got some good photos, too! Check em out! Here’s mine! I added orange zest and dried cranberries. I went the simple route—-it was yummy! Took me two tries (why do I always screw up the simplest recipes?)! Sugar, lemon zest and cranberries! i added cheddar cheese and caraway seeds! I baked mine with Kamut wheat and raisins. Happy to be your co-host this week. Thanks for baking along! Looking forward to seeing all the different types of add-ins everyone used. Cathy. What a pleasant surprise – we loved it! Posted from vacation in puerto Rico! The second time it came out great! I had such fun turning this bread green. It’s wasn’t pretty but it sure was tasty! I will make this again and again! So easy and delicious. I followed the recipe exactly, made 2 loaves, and used this recipe to help celebrate my father-in-law’s 60th birthday! LOVED by everyone!!! This recipe is great and quick. This is the story of the sad Irish Soda Bread that was left on the counter and not taken to the party it was intended for. The recipe was easy peazy and I threw in some dried cranberries to liven it up a bit. Came out perfectly! Alas, after a few Whiskey Ginger Beers, it was the last thing that came to mind when heading to the party. Oh well, after the party we tore into it and devoured it around midnight. It was especially good after all those damn Irish Whiskey Ginger Beers. And of course, a picture is not available. Moral of this sad story, never drink whiskey and bake (wine, of course, is acceptable). Great Recipe! I DO LOVE THIS BREAD SO MUCH !!!! I was missing your comments on my blog (seen how you’ve spoilt me last time?) and I’ve just realized that I’d forgotten to post my link…uhi uhi! Easy but would try with gruyere next time. Looks yummy! Here is mine.. I made one with all purpose flour and raisins, another with half whole wheat half all purpose flour and caraway seeds..
My Irish Soda bread is half whole wheat. And while I didn’t mention this in the post, it stayed fresh for several days after baking. Made a “healthy” changes…it’s delightful! I wish I could comment on your post, Kris! Loved reading about your family history and your bread looks great. This WordPress/Blogger-Blogspot incompatibility is frustrating. I had a HUGE SUCCESS!! I opted for 1/2 whole wheat flour and gruyere. Such and easy bread recipe. This was a wonderful addition to our St. Patrick’s Day dinner: corned beef, cabbage, carrots, and broth braised baby Yukon Gold potatoes. So, so much better than earlier attempts with other recipes. This bread is seriously so good!! Short post, easy recipe! Looking forward to seeing all of yours. Made this three times this month… that easy and that good. Delightfully simple, and great with tea! One to add to the “go-to” list! Here’s another one! So easy and really yummy!! Happy (belated) St. Paddy’s Day! So quick and easy to make, I can’t believe I put it off till last minute. I added a little mozzarella and sun dried tomatoes to mine, delish! Awwww yeah!!! Finally doing one on time! Down to the wire, per usual! barely got this one up in time! I made mine with dried cranberries and apricots. also posted about a deal on coconut oil…. Must be the buttermilk; it reminds me a lot of a non-flaky biscuit. pretty tasty and she is such a looker too! I think my link failed to post yesterday. I was a purest with a gluten free twist. Wednesdays With Dorie?! Straggling in! 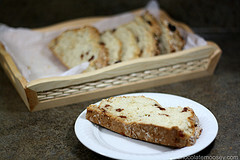 Pingback: TWD: Irish Soda Bread « Baking "Together"